“Item is restricted and Supplier is not Approve Supplier”. To Progress the Releases /PO with the item that are mark as “Use Approve Supplier” , we need to define the Item in the Approve Supplier List. Note - In Approve Supplier List (ASL)we define all the Supplier that are Approved to Supply a particular Item. ASL is very helpful and purpose of ASL is to automate the Identification of the Supplier to supply specific goods Or we cab say with ASL we are trying to automate the Source of Supply. 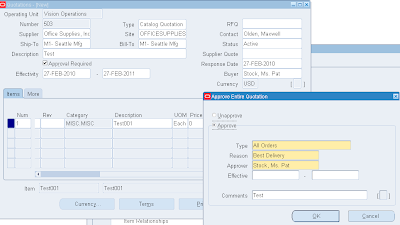 Oracle has made it very easy to define ASL in Oracle Apps Purchasing Module. Also we store the status of the Supplier. Create Release for the Blanket Agreement. Please Note that in Release we have Item Test001 and since it is marked as “Use Approve Supplier” , with Supplier now in ASL we can now approve PO release for this item. do you know where I can download all the information from ASL? also do mass updates?